when life hands you lemons, stick them in your San Pellegrino! It seems our brief period of “winter” has come to an end, lasting just under a month. For a while our whole city revelled in the under 22C weather, everyone wanting to eat outdoors in the cool breezes. Suddenly jackets and scarves and boots-wid-da-fur were being paraded out on the streets. There was an actual chill in the air and every person who sweated out 11 months of tropics wanted a piece of the action. Now the chill is gone, we are back to using the a/c at night, and the sun has come out again to remind me who’s boss. But even as I fuss, you and I know that I love being in the sun – swimming in the sea, wearing tank tops and flip flops all year, and the vibrant tropical fruits! Mango is at the very top (come over here to try the very best in the world! ), followed by mangosteens, pineapple, jackfruit, and banana. And then there is this little fellow – the chico. The chico (sapodilla) is a non-descript little brown ball…kinda scruffy and certainly not as beguiling in appearance as his other tropical brothers. The flesh is likewise brown and quite plain looking. The taste however is something else entirely. Its juicy, sandy meat has a sweetness that is at once caramelly and boozy (sometimes I feel I taste coffee…but that could just be me). I love this fruit! Tartasacher chose a simple but luscious recipe from Donna Hay — Sugar Grilled Fruits and Cinnamon Yogurt. 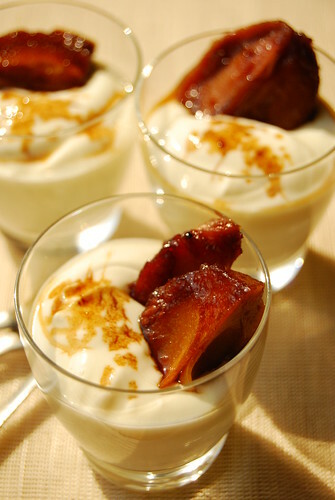 The original recipe uses figs and pears, but as fresh figs are just a fantasy over here, I decided to use my much-loved chico. To excellent results! Instead of using regular brown sugar, I used our local muscovado which is dark and earthy. Grilling the raw sugar on the fruit heightened the dark, molasses personality of the chico, and gave it a gorgeously sweet crust as well. Let me say…this will not be the last time I sugar-grill chicos! For the yogurt, I mixed in a local wild honey (instead of the cinnamon) whose strong flavour stood up well to the wildly-caramel sugar-grilled chicos. This is a wonderful treat to have for breakfast. You can even serve them up in shot glasses like I did here to make a sophisticated light dessert. ***A tie in HHDD’s last round had Meeta of What’s for lunch, Honey? and Tartasacher of Mil Postres co-hosting this round. Meeta chose the savory theme with delicious Chicken Satay (my entry here) and Tartasacher chose the sweet theme with these lovely sugar grilled fruits! Hay Hay It’s Donna Day was created by Barbara of Winos and Foodies and is now under the care of Bron of Bron Marshall. Manok Tim & a Giveaway! joey on Manok Tim & a Giveaway! Chrissie on Manok Tim & a Giveaway!